Where is the ‘most beautiful girl in the world’ now? Some of us are living the selfie life, while others – well, maybe not. Hands up if you are in the second group with us? We thought so. Taking the perfect picture is never easy. After all, there are so many aspects to think about. To start with, you have the worry of getting the perfect lighting. Then, you need to find the angle that gets your good side while also creating something artsy that will capture people’s attention. Finally, it’s time to hit the filters. Slumber, Perpetua, Crema – what do they all mean anyway? There are so many ways to edit photos it can be overwhelming. That can be why we grow so jealous of those that can take the perfect pictures without even trying; the natural beauties of this world. However, would you still get envious if the person in the photo was a child? A few years ago, the internet couldn’t get enough of a picture of a girl. In fact, it wasn’t long before she earned herself the title of “Most Beautiful Girl in the World.” A long time has passed since she first took the web by storm. Are you ready to see what happened to the star after all these years? The world has seen many photos go viral over the years. From funny animals to perfectly timed moments, and everyday heroes to a witty comment on Twitter, there have been thousands of snaps floating around for us to enjoy over the last few years. Although 2011 seems like an eternity ago, there was one photo that will forever go down in the history books. “The most beautiful girl in the world.” Shortly after the snap emerged online, people started digging into where this star had come from. How could she be so famous at such a young age? Plus, what did her parents think of all this attention their 10-year-old was receiving? 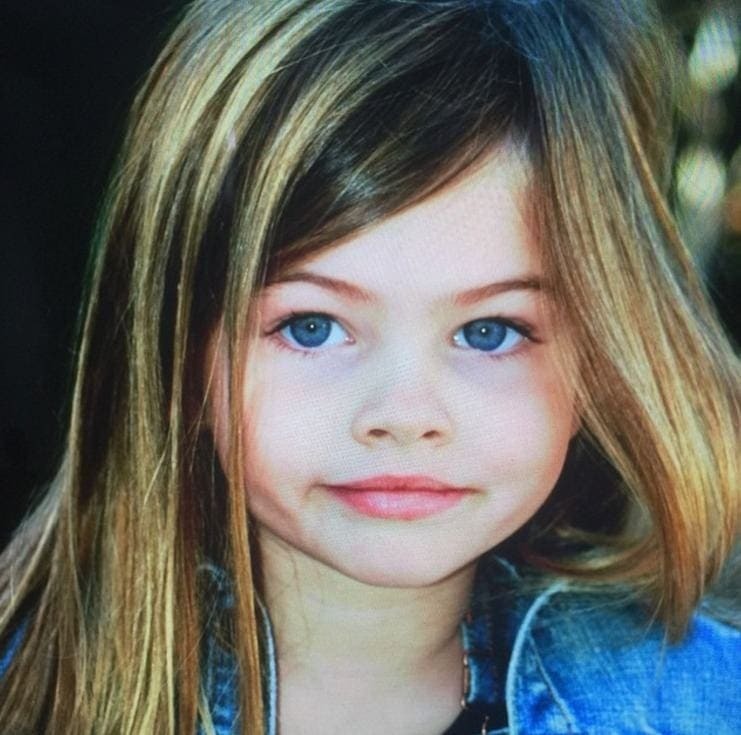 Thylane Blondeau was born in France, to actress mother Véronika Loubry and soccer legend Patrick Blondeau. However, it looked as though this youngster was about to get caught up in the world of fame in her own unique way. So if it wasn’t acting or sports, what was Thylane good at? Modeling. In fact, her age had many people talking. Various people all around the world stop and pinch the cheeks of youngsters, but would they feel comfortable with them becoming the latest fashion model of the world? After all, some of the top models in the world have been scrutinized over the years. It looked as though everyone was about to find out. Many child models begin young. However, Thylane started even younger than most of her modeling buddies. Her blue eyes and naturally long hair caught the eye of many modeling agencies, and it wasn’t long before the youngster was signed up for her first job. Although many countries don’t allow anyone under the age of 17 to walk the catwalk, Thylane was up there at just four years old. Her age had many people talking as no one could decide whether it was appropriate for someone so young to be on the catwalk. 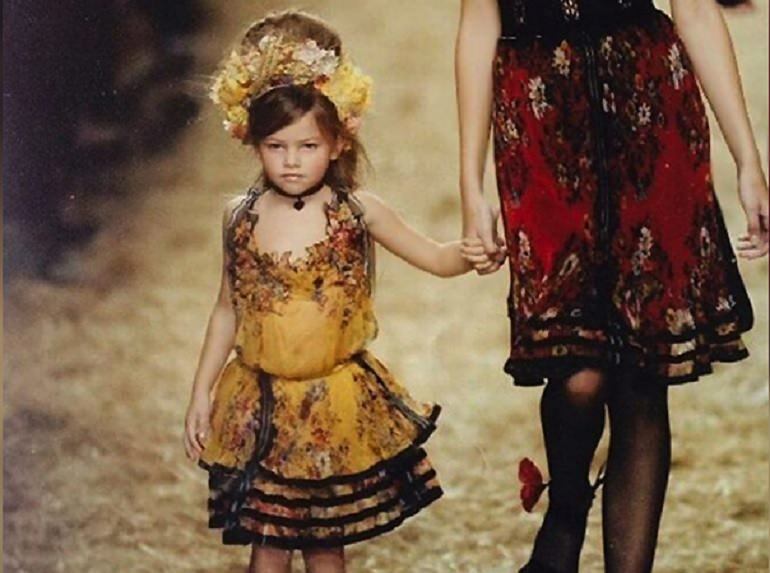 At just ten years old, Thylane was in for even more controversy than her catwalk debut. The youngster was about to feature in a special for the fashion magazine Vogue, but the world wasn’t done with talking about the youngster just yet. The shoot showed Thylane putting on a heavy amount of makeup as well as wearing high heels. It looked as though the magazine was trying to make Thylane look a lot older than she was, but was it too much? 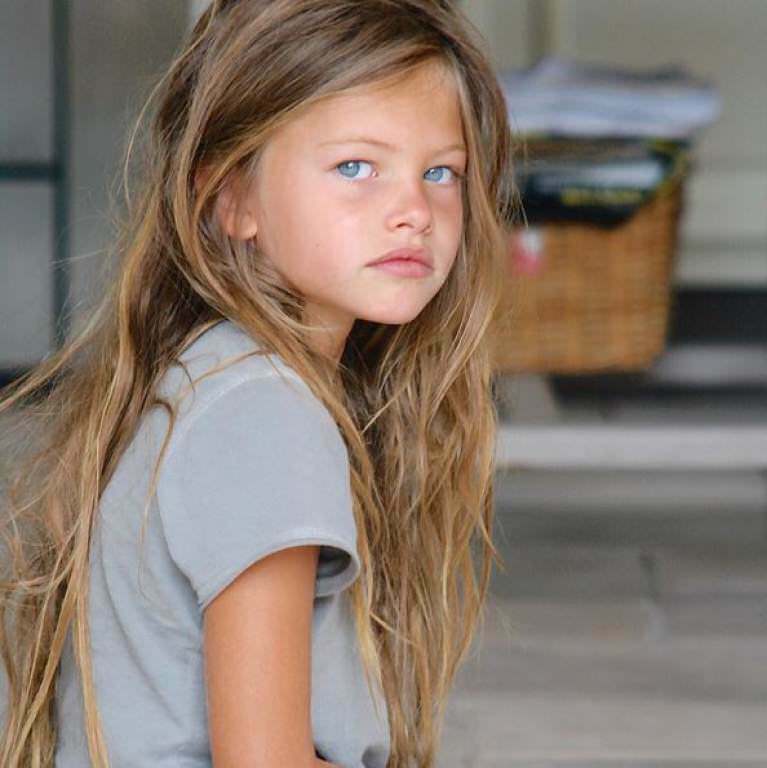 It was during her shoot for Vogue Enfants that Thylane earned herself the title of “the most beautiful girl in the world.” Her photos were designed to show off her natural beauty, but many felt as though the pictures were inappropriate. Had the magazine pushed it too far? Many criticized the photos for being unnatural for a 10-year-old girl, as well as suggesting that it forces youngsters to grow up before they are ready. To top it off, Vogue had produced a whole spread of pictures of the young model. It wasn’t long before even psychologists began to offer up their opinions on the photos. Could they really have been that bad? One leading psychologist, Emma Grey, had plenty to say on the matter. She felt as though Thylane wouldn’t be emotionally equipped enough to deal with the backlash of the photographs or the message they were trying to portray. Although not everyone saw the harm in the photo shoot, it certainly divided the opinions of the world. Many saw the photos as inappropriate. However, others saw the flip side of the situation, including her own mother. Véronika was quick to point out that her daughter had forged a career for herself that meant she was able to wear $3.6 million necklaces all on her own. Even though she was defending her daughter and her decisions, Véronika knew the entire family was about to be in for plenty of backlash. Would she be able to protect her daughter from the world or was it too late? Although Thylane’s mom was defending her daughter’s choices, she knew that she needed to intervene to try and keep her child safe. What could she do? Véronika had been in the world of fame for long enough to know that social media was one of the greatest weapons, so she quickly shut down her daughter’s pages. Now, no one could get in touch with the family. Plus, Véronika also admitted that she had already turned down huge offers for other photo shoots. You may think that being one of the most recognized youngsters in the world makes it hard to live a normal life? Somehow Thylane has always managed to split her time. According to the star, she travels the world modeling and meeting up with connections around the globe, while also having many friends. Although they know about her career, apparently Thylane has never discussed her modeling with her friends, and they don’t ask. This model just wants to live a normal life when she isn’t in front of the camera. Modeling can conjure up images of makeup and glamour, but for Thylane, it’s not all about the look. According to the youngster, she enjoys spending her spare time playing the drums and skateboarding. In fact, Thylane admits she is a tomboy when she isn’t modeling! This star really is living two lives. Thylane puts her love of tomboy passions down to her soccer-playing father. That doesn’t mean that designer clothes and makeup aren’t still a huge part of Thylane’s life. As well as her tomboy side from her father, Thylane has also inherited some of her mother’s skills – her acting skills to be precise. Back in 2015, Thylane starred in a French movie that translates to Belle and Sebastian: The Adventure Continues. Would she be able to pull it off? The reviews were in, and she was about to have an answer. Everyone loved her performance! Is there anything Thylane can’t do? The star admits her goal is to be just like Angelina Jolie. 13 years old can be a difficult age as the teenage years begin and everything starts to change. However, for Thylane she was continuing to further her career and make huge breakthroughs. At such a young age, Thylane was now the star cover girl for Jalouse magazine’s April cover. Her natural look and light makeup had everyone stunned with no more harsh comments. 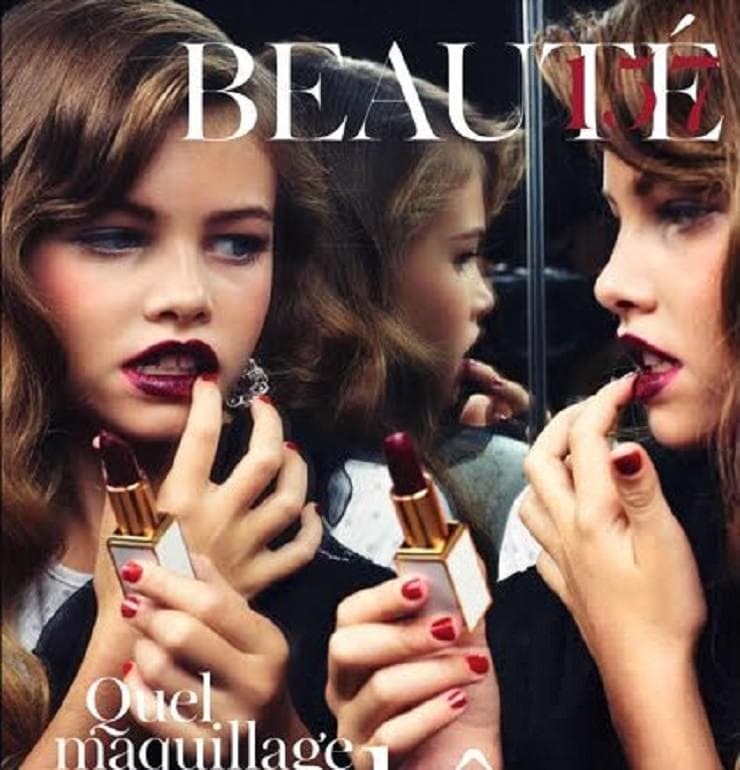 If that wasn’t enough, the magazine even compared the young model to Kate Moss – what an honor. It’s been seven years since the photo shoot that got everyone around the world talking, but where could this star be now? At 17 years old, this model has been keeping herself busy over the years. She may have grown up, but Thylane still has the same signature looks that gained her all the attention so long ago. It doesn’t look as though this star will be going anywhere anytime soon. So just what has she been up to over the years? 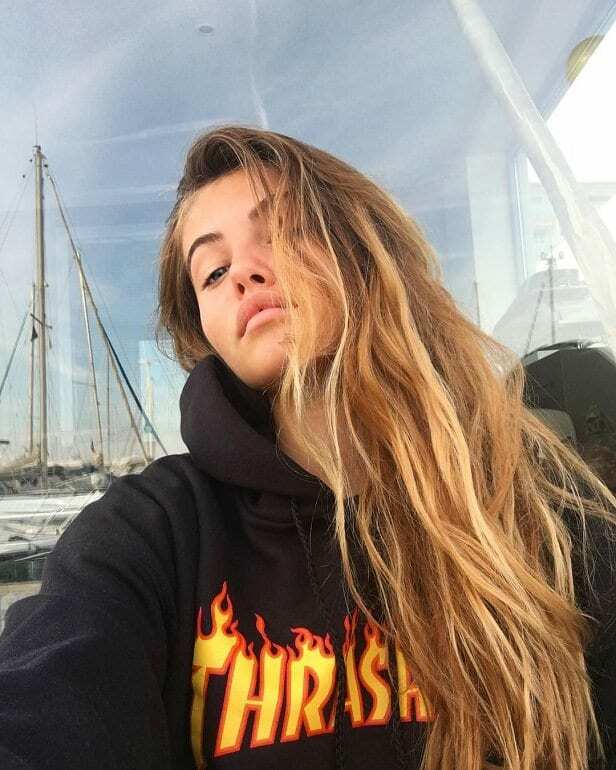 Rather than her long blonde hair, Thylane is now sporting a darker brunette style, but the new look doesn’t mean she has shied away from the cameras. In fact, Thylane still models for major fashion brands all around the world – all before she has even become an adult. Could she really be the next Kate Moss after all? It looks as though the star has put all the controversy from her childhood behind her as she continued to carve out her career. 13 years on from her first runway appearance and Thylane is still hitting the catwalk as she dominates the world of fashion. Thylane is now considered to be on of the “it girls” in modeling. Plus, in 2017 she was given the opportunity to walk in Paris Fashion Week – a huge honor for any model. 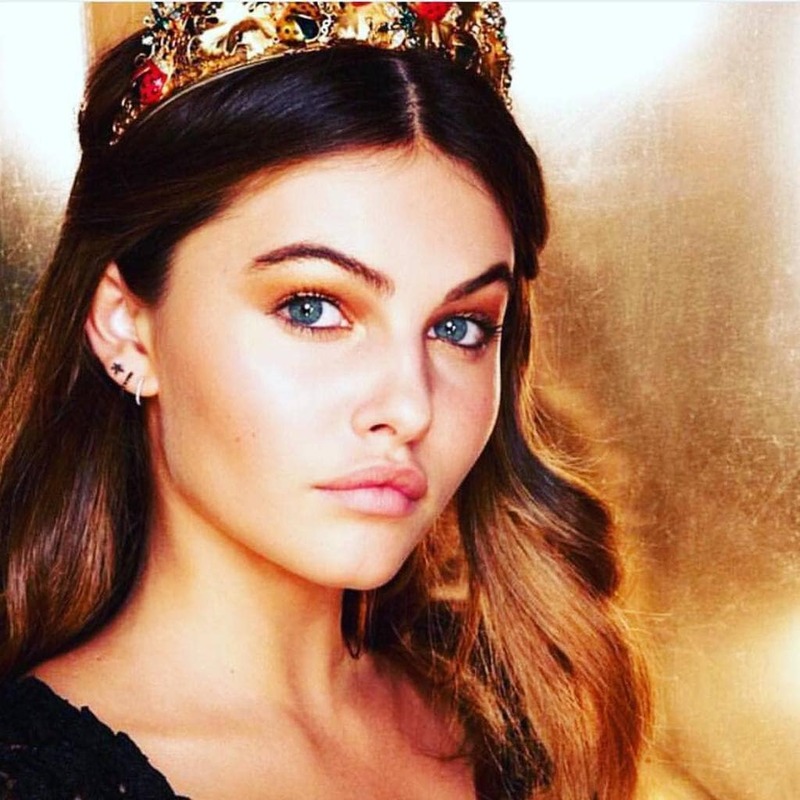 Thylane has reported how the younger models are appealing to the younger audience the fashion brands are trying to target. We can see how she is bringing in the crowds! As well as hitting the runway, Thylane has also been making more appearances, only this time it is on the red carpet. As a 16th birthday present, the model was asked to become the new face of L’oreal. After signing up with the cosmetic company, Thylane was given a chance to appear on the red carpet. Her first time up next to the stars was back in 2017 when the young model appeared at the Cannes Film Festival. Just another notch in the belt for this rising star. Thylane rose to fame as the most beautiful girl in the world. That is already quite the title, but that doesn’t mean the world was done appreciating this star’s beauty. How would she top her nickname? In 2016, a list emerged that named The 100 Most Beautiful Faces of the year. With so much competition, it would be hard to make it onto the list at all. Thylane didn’t just land a spot; she walked away with fifth place! Being 17 years old can be a difficult time for any teenager, let alone a teen that has featured at Paris Fashion Week. However, Thylane is determined that her fame won’t stand in the way of her living a normal life. When she isn’t being a superstar, Thylane continues to attend a normal school so she can earn all her grades. This model appears to have her whole life planned out in case something happens. Brains and beauty? How can anyone keep up? Rocking photo shoots? Check. Stealing the show at runways? Check. Hitting the red carpet? Check. So what else is left for this model to dominate? After her mom deleted her Facebook account all those years ago, Thylane has since taken over Instagram. Amazingly, Thylane has over 2 million followers that get to see the star’s various photo shoots, as well as behind the scenes snaps that are enough to make anyone green with envy. It looks as though life for Thylane is just too perfect. It appears as if being branded The most beautiful girl in the world was only the beginning for this young star. Even all these years on and she is still rocking the modeling world with her looks and skills in front of the camera. Thylane has built a huge fanbase for herself thanks to her social media and continues to represent L’Oreal. Plus, Thylane has a short film about her career, as well as continuing to work her way up the acting ladder. Life couldn’t get much better. This has to be some sort of a joke, right? There is no way this girl here is actually 17… It seems to be a common theme for Thylane to look “mature” than she is, whether she’s seven years old, or whether she’s 17 years old. Granted, it probably has a lot to do with the makeup, and the glamorous adult hair stylings, but still – it truly is shocking nevertheless. This girl needs to tone it down at least four to six notches. In the Instagram account that we’ve already explained has been gaining quite a lot of popularity, at over two million followers, Thylane has taken to letting us into her most intimate settings behind closed doors. In this picture, she captioned the photo “not a morning person,” and considering her tired look, we see what she means. Then again, if this is what she looks like when she wakes up – we see what all the hype is about. Whether you’re a 17-year-old supermodel who the world adores, or whether you’re a 30-year-old Hollywood actress, no one like to miss out on a good opportunity to dress up into costumes. In this picture, Thylane is showing us her prowess at dressing up, wearing a black mini dress to go with a pair of disguising black glasses. She seems to be at a prestigious dress up event, but we’re guessing no one had trouble guessing who she was. No matter how prestigious of a model she may be, this Instagram post shows her age better than any of us may have expected. 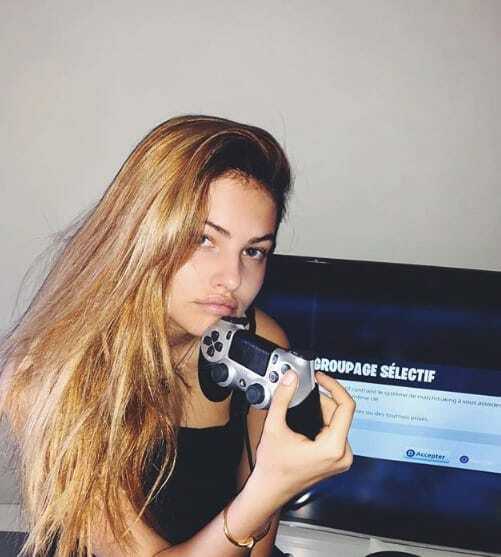 In the post, she captioned it “wanna play?,” which was, of course, met with a barrage of exuberant fans that obviously wanted to play some video games with her. But she’s not just playing any video game – she’s playing the popular Fortnite, and judging by the look on her face, she’s got some serious gaming skills. For those of you who aren’t well versed in Disney-lore, our “Belle” reference was to the classic DIsney film Beauty and the Beast, where the princess in none other than Belle, who is known for her love of reading books. So too in this picture, Thylane seems to be holding an open book in her hand, showing us that she is very similar to Belle in that she also loves to read. It makes us wonder who the lucky beast will be. While hanging out in London for a little while, Thylane decided to stop by a nice British restaurant known as the Ivy Kensington Brasserie. While there, she decided to order herself a fresh lemonade drink, and it seems that she enjoyed it so much that she had a picture taken of herself drinking it. It really does look refreshing, and it’s this type of snapshot that reflects on the type of “good life” she’s living. If you’re wondering why our girl is wearing an elaborate long dress on a sandy beach, we assure you it’s not because she thought it would hold well in the ocean. It’s obviously because she is doing what she does best – a photoshoot. As you know, she’s been a natural at this whole modeling gig since she was a mere little child, and it shows here. She’s practically a veteran at this point, which is crazy when you consider she’s still not allowed to drink. Here is a photoshoot that she took in the middle of a forest. Wow, these photographers really are getting creative lately, aren’t they? But now that the picture has been taken, we see what their vision was. They understand that Thylane is no longer the little girl she once was, and they want to show her in a new light. Her black dress, her casual expression, mixed with the natural lighting of the autumn outdoor setting – the whole thing is very well put together. Very recently, Thylane was signed to be a model for the clothing company Juicy Couture, and the caption for this picture suggests that she pretty happy about it. “So proud to be the face of @juicycouture” – that really does show loyalty doesn’t it – from both sides. It’s one thing to be a model for a clothing company – it’s another to be the face of their brand. But did we really expect anything less from her? This girl is really traveling the world, from her hometown in France, to London, and of course, the big apple – also known as New York City. They say it’s the city that never sleeps, but considering the fact that Thylane is still only 17 years old, she may have a curfew. Still, she is starting to look more adult than ever, with her chic looking handbag and business-woman looking style ponytail in the air. Just when we think that we have this girl pegged, she comes out and surprises with another interesting thing about her. If this picture is any proper indication, Thylane likes playing basketball, and even if she doesn’t enjoy playing – she clearly appreciates the sport. Considering the fact that she goes to American big cities such as Los Angeles and New York, where the basketball market is quite large – it makes sense that she’d get influenced. Can this girl get any cooler? First we find out that she likes basketball, but now this? She seems to be not just a lover of music, but of the all time classic artists. In Thylane’s hands is a vinyl record of Bob Dylan’s “The Times They Are A Changin.’” Considering the fact that most of the people her age don’t even know who Bob Dylan is, it’s pretty impressive to see her taking an interest in some of the all time pioneers of modern folk rock. 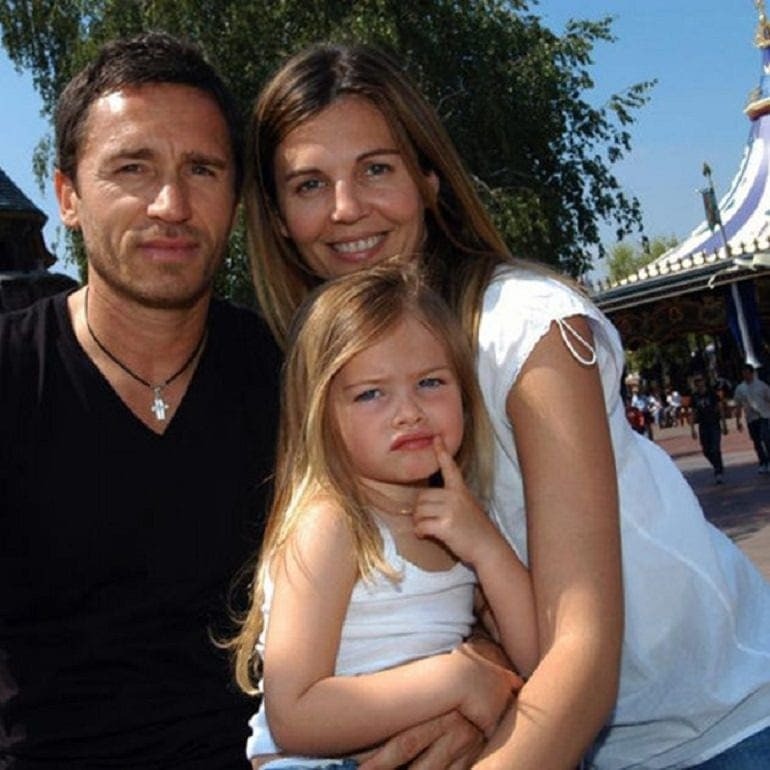 With her furry black jacket and blue jeans, Thylane decided to let the child in her come out when she visited Disneyland in Paris. It may not be the original Disneyland, but that doesn’t mean that it isn’t fun. Plus, she seems like the type of girl that brings the party wherever she goes, regardless of the situation. And we’re guessing that when she saw Mickey Mouse, he was probably the one to want to take a picture with her, instead of the other way around. We’ve been having a good time appreciating the difference between the pictures where Thylane is modeling in front of a professional photographer and photo setting, and the pictures where she is by herself, taking amateur selfies on her phone. The kicker here is the even the amateur selfies are done with the flair of a professional, as you can see here. Having just woke up, she seems intent on letting us know she’s a morning person through and through. Here we have another amateur selfie, except instead of her just getting out of bed, she seems pretty darn awake here. She seems to be at some sort of event, and her energy in this picture shows that she’s having a blast. 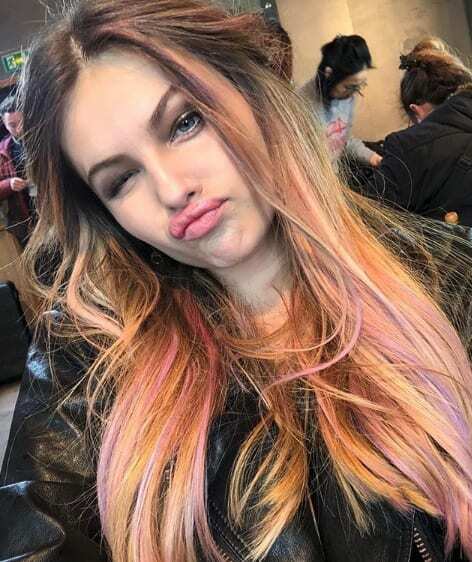 With her pink highlights and her quirky expression, she shows us a different side of her that we don’t often get to see. It’s wacky, fun, filled with attitude, and we absolutely love it.